Always hungry. Always in a hurry. Getting a dinner break is always a luxury..especially when I’m working alone. One day last week, my first task was in Kalamazoo. Since I live there and it was something I could handle on my own, I did what I needed to do and started heading north to join my co-workers in Grand Rapids. I didn’t get much of a lunch because I had to go in early and it was pushing dinner time. I seem to always stop at the same few places along the way, so my idea was to find something different. I knew there was a pizza place in Martin…I just didn’t know the name of it. Google to the rescue….sort of. I Googled “pizza Martin, MI” and got a listing for Palazzolo’s Pizza. When I called the number, that’s not what they said, so I hung up, pulled off the road, and looked it up again. It came up with many different names including Palazzolo’s, Lenny’s, and Marco’s. None of those are there anymore, but they were all in the same building and have the same phone number. 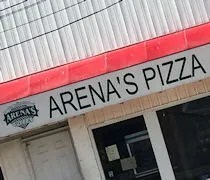 I finally figured out, the pizza joint is now The Original Arena’s Pizza and it’s part of a small chain. 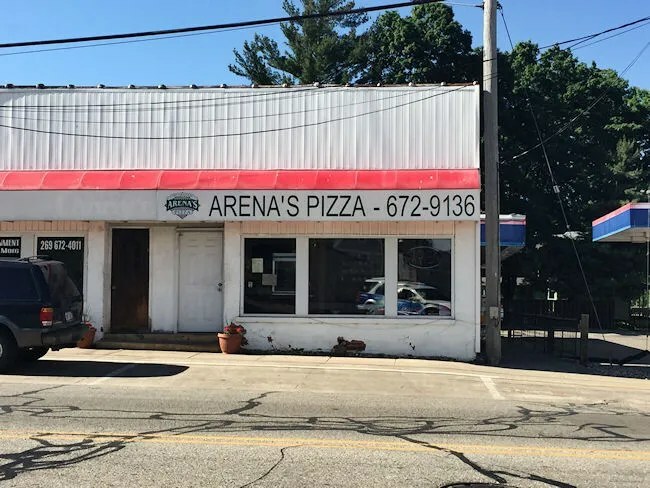 The Original Arena’s Pizza in Martin is one of four in the area. The other three are in Muskegon, Bostwick Lake, and Rockford. The Martin shop is right near the main downtown intersection. It takes up half of a pretty rundown building next to the Clark Station on the corner. 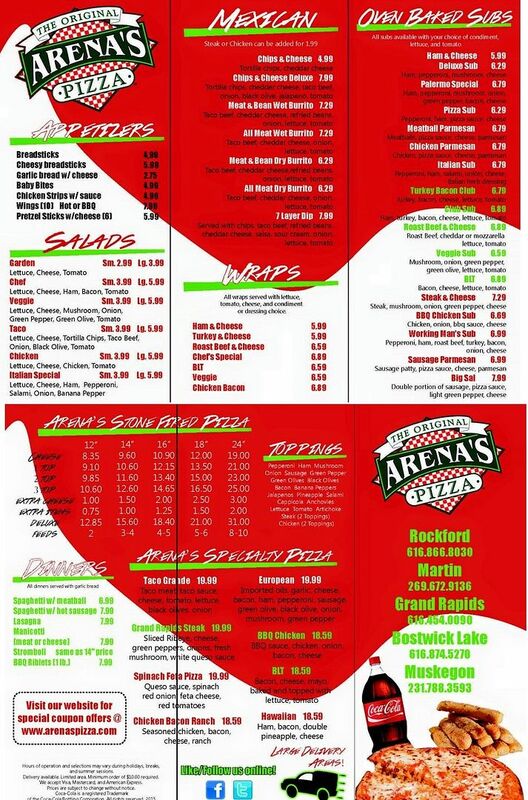 I ordered my pizza as I was leaving Kalamazoo and I really couldn’t find a decent menu online. I did finally find one for the Rockford store. I assumed that was the same and called in the order. 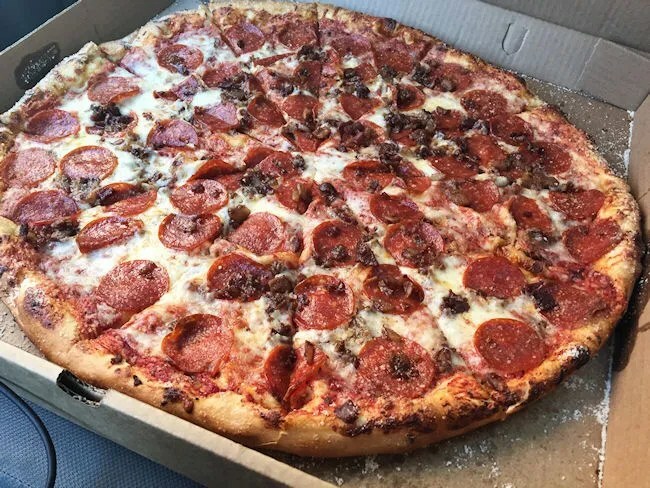 I got an 18″ with pepperoni and bacon. The pizza man said it would be about twenty minutes and I was about twenty minutes away, so the timing worked out perfectly. There are only a couple spots to park in front of the business on Allegan Street and both of those were taken….including one by who I think was an employee on their smoke break. There’s an unpaved lot next to the building that I assumed was or used to be a parking lot, so I pulled in there next to the dumpster. Smoker man gave me a dirty look as he was taking garbage to the dumpster, so I’m not sure if it was actually parking lot or I was parking someplace I wasn’t supposed to be. So, after walking through a cloud of smoke, I went inside to pick up the pizza. Just like the outside of the building, the inside has seen better days. There are some tables if you’re in the dine-in mood, but the order counter is right inside the door and that’s as far as I made it. The man making the pizzas asked if I was picking up then brought a large box to the counter. The cost was a little over $15 and I paid for it with a credit card. The unfortunate part of this story is I very rarely get a lunch break at work and sure enough, I got sent out right away as soon as I got back to Grand Rapids. I quickly ate a couple pieces in the parking lot, but most of it would sit in my car for another two hours before I finally just pulled off the road and ate it. I say “unfortunate” because the pizza was actually really good. It was a thin, doughy crust with a sweet red sauce that was just a little bit spicy. 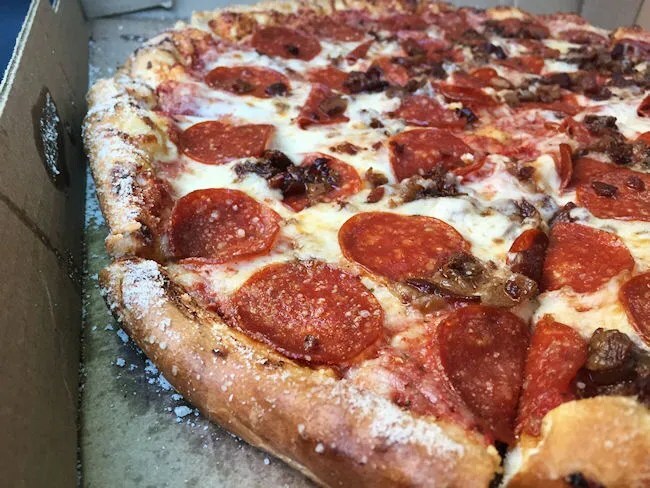 The grease from the pepperoni and bacon had pooled on the top of the cheese…just the way I like it. I don’t go through Martin very often, but I actually really liked this pizza. It’s different from most of the chains and even different from most hometown pizzerias. This is one I would actually consider getting off the highway for again if the craving for pizza ever hits me between Kalamazoo and Grand Rapids.